Business Institute of Australia (BIA) offers nationally accredited and internationally recognised qualifications in the fields of management, accounting and management. 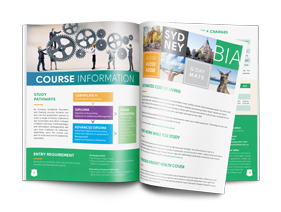 Qualifications obtained at BIA fulfils the requirements of Business and Financial Services Training Package, and could also be used to pathway into further studies offered at universities and colleges across Australia. BIA is a Registered Training Organisation (RTO), registered by the Australian Skills Quality Authority (ASQA) under the National Vocational Education and Training Regulator Act 2011 (NVR2011) and the Australian Qualifications Framework (AQF). BIA is also registered on the Commonwealth Register of Institutions & Courses for Overseas Students (CRICOS).